Click your way to stimulation. This was my entry for LD39 and #clickclickclick, ish. Download it from itch.io (the project files are there too). 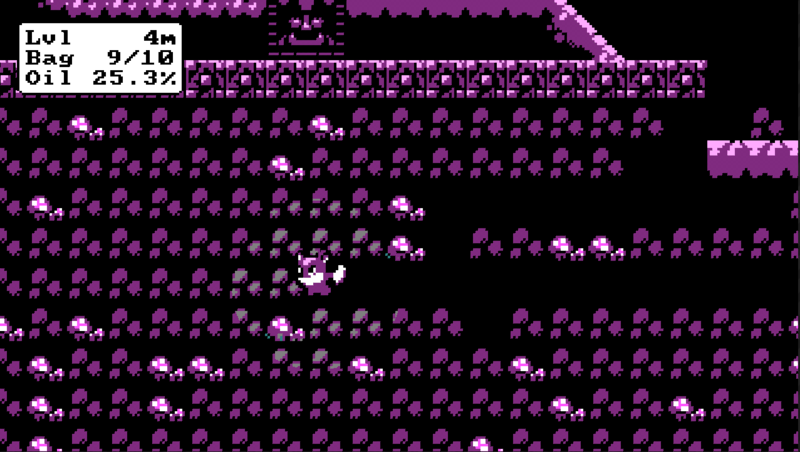 Note: I realized my core game idea wasn’t really going to work pretty early on, and decided to focus on ‘feel’ and learning Cascade instead, so there’s a lot of juiciness but little substance (more of a toy than a game, though it is possible to fail). Built using Unreal Engine 4.16.2 entirely in Blueprints. Zen Miner is meant to be a chill mining game in the style of Miner Dig Deep where a fox collects ore and sells it to purchase upgrades, allowing them to go deeper and find better ores. This fox is all about the vicious loot cycle. Created for #cgajam using CGA palette 1 and a nearly CGA 320×180 virtual resolution (dithering happens at a higher resolution however, see this article for details on the post processing). However, the gameplay was not really finished in time for the submission deadline; the uploaded build has the very basics of the gameplay loop (you can mine, sell ore, and refill your lamp oil, but there are no upgrades or deployable items yet). If you still want to play it, download it from itch.io. In this series of articles I’m going to show how to create some high-impact, low-effort tools to help develop your game in UE4. Tools range from simple batch files or humble debug commands to complex ensembles like the UE4 level editor or Max/Maya; but for now let’s focus on some approaches that don’t require a broad knowledge of Unreal Engine or Slate to pull off. Some of these topics deserve a post of their own, but I’m going to start with more of a survey approach and see what people are most interested in digging into. 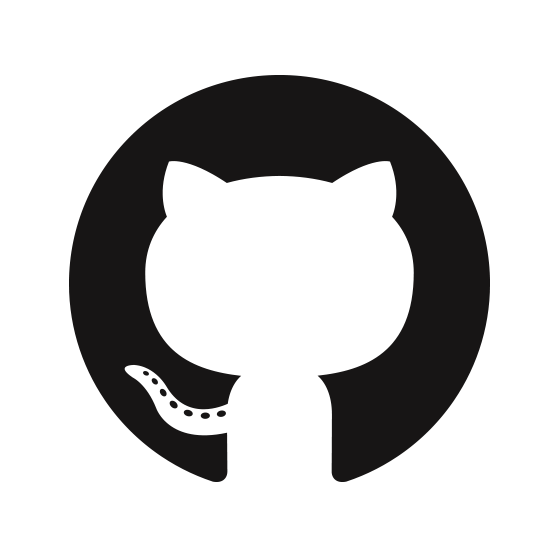 Programming is all about strategic laziness: the guiding philosophy developing tools is to spend time now to save someone time later, improving overall developer efficiency. This might play out by allowing the user to finish the same tasks in less time or it might allow them to perform more iterations in the same amount of time, increasing polish level and fun factor. Ideally you also save more time than was involved in making the tool, but that is not a hard requirement due to other factors like user morale, making it possible for a different group of people to do the work, reducing mistakes when the cost of failure is high, etc… This is especially true when it comes to automating key processes where a mistake might cause downtime or otherwise hurt your customers, e.g., releasing a broken update or corrupting a database. I spent some time last weekend prepping for #cgajam by playing around with different materials / effects to constrain a UE4 game to CGA colors, and came up with a drop-in post processing BP. Download the template (requires Unreal Engine 4.16, licensed as CC0) and unzip it. 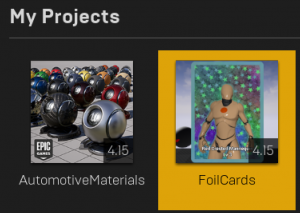 You can either open the project directly and migrate the Content/CGAJam folder into your project or drop the whole folder into the templates directory of your 4.16 installation (e.g., C:\Program Files (x86)\Epic Games\UE_4.16\Templates) and then create a new project (info on how to make a project into a template here). There’s an example map but all of the magic is wrapped up in BP_CGAPostProcess; just drop one into your level and try playing around with the settings to suit your content. You can pick one of the two palettes, adjust how much color-space dithering and screen space dithering there is, and tweak the overall gamma / brightness. For the hand painted environment I found 50% screen dither + 50% LUT dither at level 3 to give me the best results, but for the example scene with solid shapes and color fills, 100% screen dither with no LUT dither looked better. CGA had a variety of different modes and palettes, but the most memorable for gaming was the 320×200 graphics mode using either palette 0 (black, red, green, yellow) or palette 1 (black, magenta, cyan, white). Color 0 (black) is actually adjustable to any of the 16 CGA colors, though it doesn’t appear to be allowed for #cgajam. The red and green components of colors 1..3 are the same in both palettes as well, only the blue color differs. 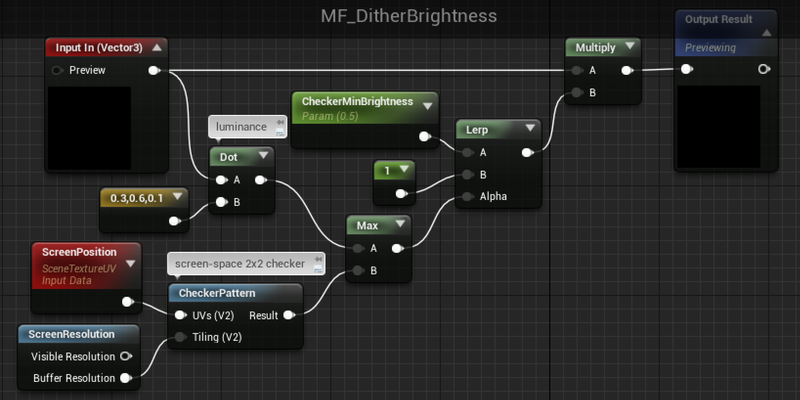 UE4 has a lookup-table texture (LUT) based color grading system, but there’s no way to control the filtering used to sample it, so it can’t produce ‘crisp’ CGA colors. It’s still useful to get colors to nearly the right place though. I’ve included 4 LUT textures for each palette with varying color-space dithering (0%, 25%, 50%, 75%); you can adjust the strength of the color grading as well to vary the effect. The post-process material (M_ForceCGA_PostProcess) has a screen-space dither pattern which dims based on brightness prior to matching to one of the four colors in the active palette. The color matching (MF_ForceToCGA) and dithering (MF_DitherBrightness) are split up into separate material functions to make them easier to reuse, e.g., in the UI material. The actual color matching is done using a cheap lookup texture with red->U and green->V (the 2×2 texture is set to uncompressed, clamped instead of wrapped uvs, nearest filtering, etc… to give us a clean and exact output value). We can ignore the input blue entirely as mentioned above, and multiply the output blue with the correct value for the current palette (dim it for palette 0 and keep it as-is for palette 1). Stick with the CGA colors, which need to be specified differently in the UI than in the world since UI happens in a different color space, e.g., yellow is (1,1,0.092) instead of (1,1,0.333) (the correct final color will show up in the hex sRGB setting of the color picker). Get in the right ballpark and use a retainer box with the Effect Material set to MI_ForceCGA_UI_Palette0 or MI_ForceCGA_UI_Palette1 to guarantee that you only use the correct 4 colors (recommended approach). Try combining it with an edge detection material (either on depth or on custom stencil if you want to limit the effect to foreground objects) to put black outlines around things. Try other spatial variation patterns besides a 2×2 checkerboard; techniques like Real-time hatching would probably work quite well. The map used in the example shots is from the “Hand Painted Environment” marketplace pack by Evgeniya Yaremko. The Epic Games Launcher shows a thumbnail for each project, looking in two places: first in the root folder of the game for [ProjectName].png (next to the .uproject) and then Saved\AutoScreenshot.png, which is created by the editor automatically. You can create your own thumbnail (192×192 .png) and set it using the “Project Thumbnail” option in the Description category of Project Settings. You can also customize the splash screen shown when the editor or game is starting up (separately for editor vs game, windows vs mac) in the Windows / Mac categories (under Platform) of Project Settings. The splash screens need to be .bmp (not .png), but they can be whatever size you want within reason (the startup text and project name are overlaid on top of it, so you’ll probably want to leave space for that). You can pick application icons and mobile startup screens in the various platform settings options pages as well (the rules for these are varied and some platforms require a wide range of sizes, but it’s all listed in the corresponding settings pages and platform vendor web sites). Due to the variety of required splash screens for a universal iOS app, the size can start to add up noticeably, so it can be worthwhile to approach them differently, using large fill areas that will compress well, run pngcrush on them, etc…. Earlier this week I saw a really neat effect where @Sererena simulated the view-dependent shimmering of a foil card, fed by a smartphone accelerometer. 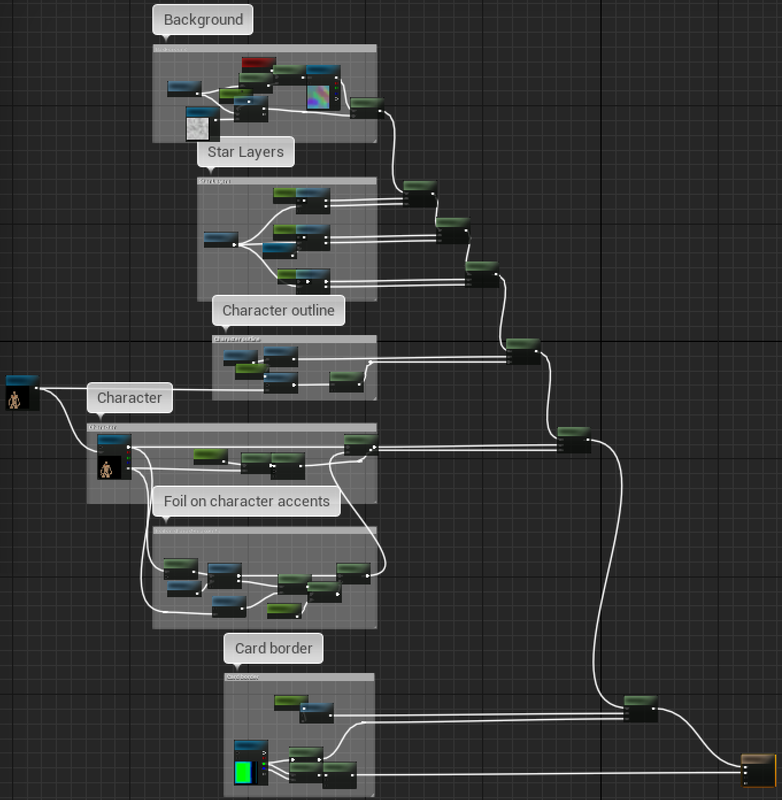 This seemed like a good challenge to improve my material creation skills in UE4, so I gave it a go yesterday and came up with something I’m reasonably happy with. The view angle is controlled by WASD rather than the accelerometer since I was more focused on the material. You can download the assets and test project (built with Unreal Engine 4.15), licensed as CC0. The foil character accent layer and the star layers all parallax as the view angle changes (shift around, with a larger shift for nearer layers, faking a sense of depth). The foil layers (everything except the character) are colored by a lookup into a ‘holographic plate’ texture, using an ad hoc function of the tex coord, distance, and tilt amount. The character accents layer is done with a color notch filter and one star layer, directly added to the character color (rather than lerping to it). This is the part I’m least happy with in the current implementation, but I’d need to test it with a real character to see exactly what I’d want to change. The material is built using a bunch of material functions as building blocks to make it cleaner, but these aren’t meant to ‘stand alone’; there are lots of assumptions built into them about textures and parameter values. I’m using a live capture of a 3D character instead of a 2D base, but after the capture Blueprint updates the render target, everything else is the same either way. The capture BP is an opaque box containing the character, a capture component, and a controlled light source. Even with setting the capture component to only capture the self actor and setting an aggressive culling distance, some ‘global’ things like atmospheric fog still render into it, so I had to use the mode that gave me depth in alpha rather than an opacity mask in order to discard it. The outline is done with a Sobel edge detection filter on the thresholded depth from the character render target (which has depth as alpha). Rather than using a kernel of the adjacent texels, it uses texels 8 away to increase the width of the outline. If I were using 2D characters I’d probably skip the runtime Sobel filter and do that offline once into a mask texture. The music is having a tantrum and can’t decide how fast to play. You move with the tempo, as do the enemies. Watch out for environmental objects like spike blocks, they don’t have ears and will keep moving regardless, so don’t get caught in their tracks when the music stops. Don’t move when the music has slowed down, and avoid anything red. The theme for the 2017 Train Jam was ‘unexpected anticipation’, which was pretty challenging to work with. The first thing that came to mind was Johann Sebastian Joust, which fits perfectly but already exists. We bounced some ideas back and forth and ended up wanting to do something similar to Joust or musical chairs with stop and go gameplay, leaving you anticipating needing to stop but not knowing exactly when. The environmental enemies give a nice risk-reward mechanic, do you try to cross their paths and hope you don’t get stuck, or do you go the long way around? 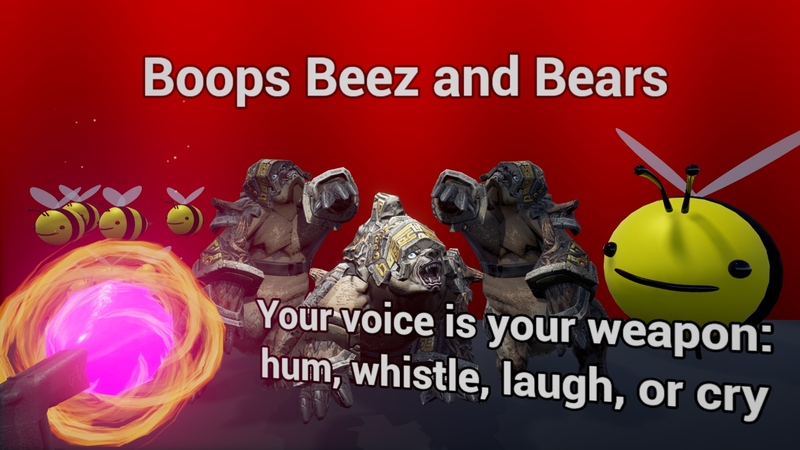 In Boops, Beez, and Bears, your voice is your weapon: hum, whistle, laugh, or cry – whatever works for you, just do it fast! It’s a cross between between a horde-mode survival game and a participatory art experience; best enjoyed with a crowd, who are likely to be amused by your vocal antics while avoiding the annoying beez.